Nam Le , The Boat. "Nam Le is extraordinary. His editor remarked to me that he ‘must be heard’; I would add that he will be heard, that The Boat will be read for as long as people read books. Its vision and its power are timeless." "Wonderful stories that snarl and pant across our crazed world ... An extraordinary performance. Nam Le is a heartbreaker, not easily forgotten." Nam Le reads from The Boat. The Amazing Nam Le will be here to Read and Sign his Book! Nam Le has written a stunningly inventive, deeply moving collection of short stories: The Boat. 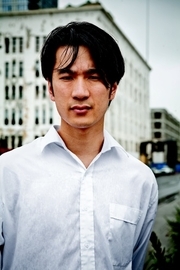 Nam Le was born in Vietnam, raised in Australia, and went to the United States to attend the Iowa Writers’ Workshop. His work has appeared in Zoetrope, Harvard Review, One Story, A Public Space, the 2007 Pushcart Prize anthology, and The Best American Nonrequired Reading 2007. He divides his time between Australia and the United States. Nam Le is currently considered a "single author." If one or more works are by a distinct, homonymous authors, go ahead and split the author. Nam Le is composed of 2 names. You can examine and separate out names.